The best investment we made this year….was new patio furniture. How we had lived here for so long without anything besides an outdoor dining table and a small loveseat tells you how much time we spent hanging out on our back patio. Zilch. After perusing all the catalogs for the best deals and the right look, we opted for these pieces from Ballard Designs. They complimented our dining table without being “matchy matchy” and were much less than the sets I coveted from Janus et Cie. 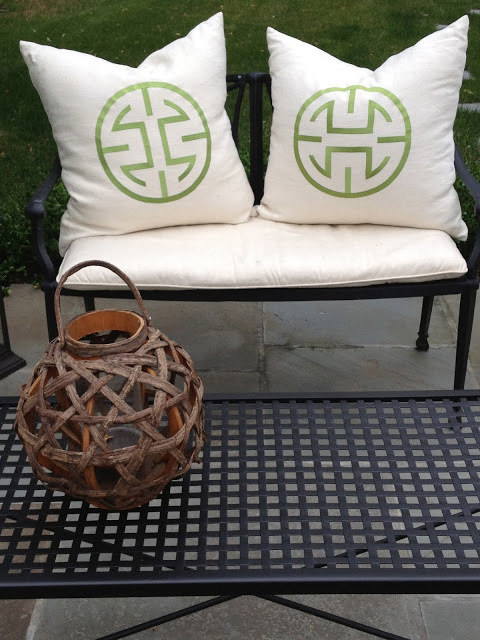 The pillows with the green Chinese symbol are from HB Home…and though not for outdoors (we bring them in most nights) they help this area feel like an extension of our home. Most evenings at dusk (my favorite time of day), you can find me outside with my homemade limeade drink, listening to music, watching the fireflies and grateful that I finally have someplace to sit. 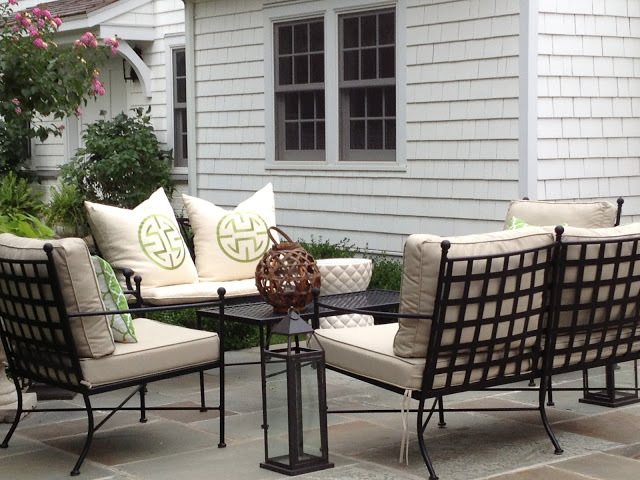 Do you have a favorite outdoor area? 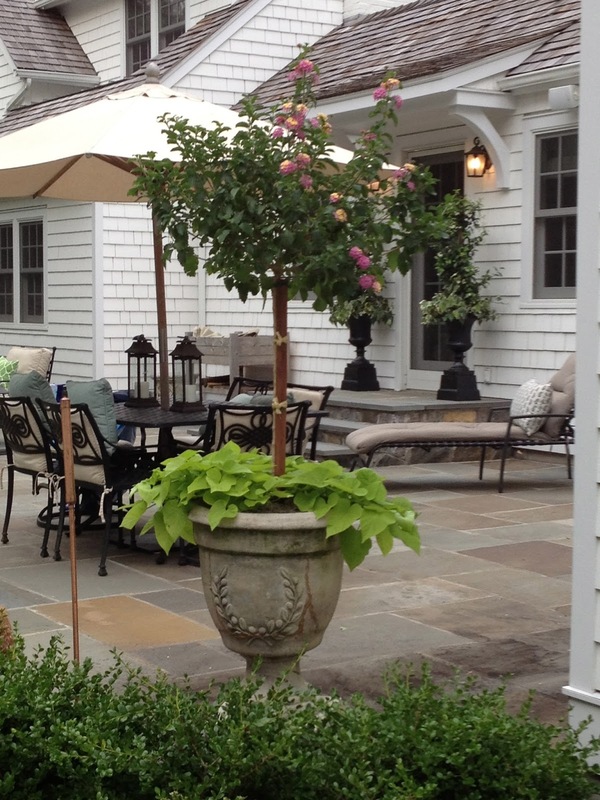 Elizabeth your outdoor room is fabulous! We have a lovely screened porch on the side of our home but use the front porch. No furniture but the porch is the same height as a chair so comfortable for sitting and we hang there all the time. The space looks amazing! Great job E! Your patio looks so inviting!!! Isn't it wonderful to have an outside space to relax. We spent the whole 4 day weekend in our backyard and unfortunately, I have the sunburn to show for it. Looks gorgeous Elizabeth. Love the colors and the pop of that fresh green is fantastic. 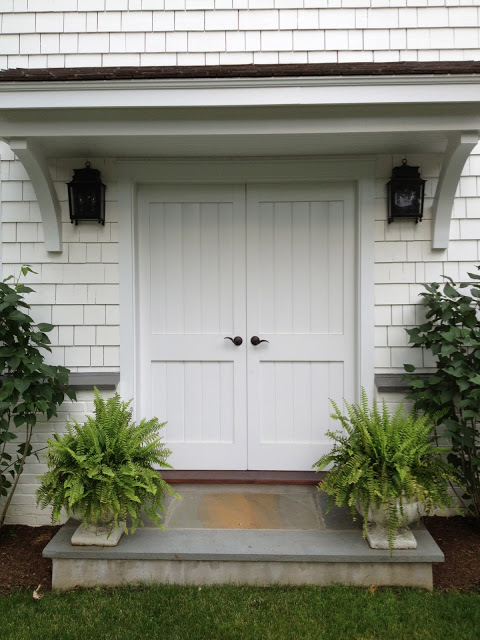 What a beautiful welcoming and intimate space you have created…hope you are enjoying it! We are experiencing the same thing as we finally got the backyard we have dreamed of since we bought our home almost 30 years ago! And the best part is we did it all on our own! We sit out there all night just pinching ourselves! It is so rewarding and magical. Keep enjoying your new space! It looks fantastic, Elizabeth. Very inviting. I'm glad you are getting new-found use out of your patio. There's no better place to be on a sunny summer day than out doors. I especially love the pillows. Looks so pretty! And definitely a place I'd like to hang out in. I'll bring some limes if you save me a seat E! It looks positively beautiful. I spend most evenings out on our patio too. So relaxing. 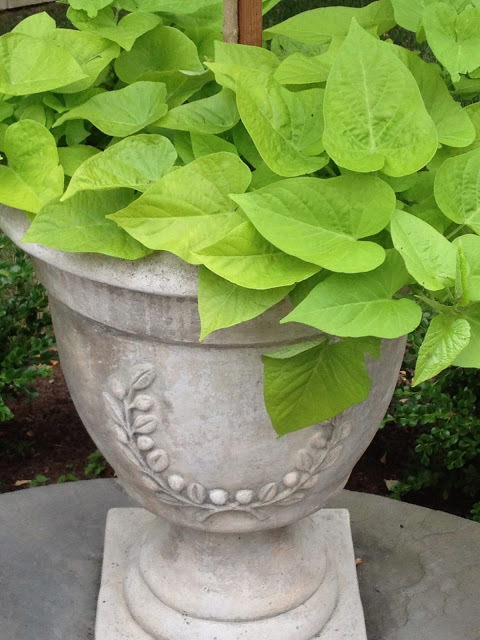 Your pots look gorgeous! 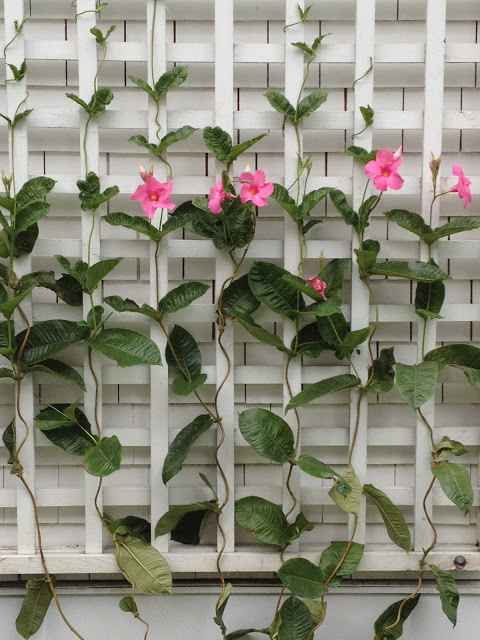 Your patio is beautiful! I love the furniture, but also the stone of your patio. We are putting in a pool and should be done next week. I can't wait to start decorating! So pretty! Every part of it is perfect! We are patio lovers too, morning and evenings, lunch when we can. Enjoy the beauty you have created! 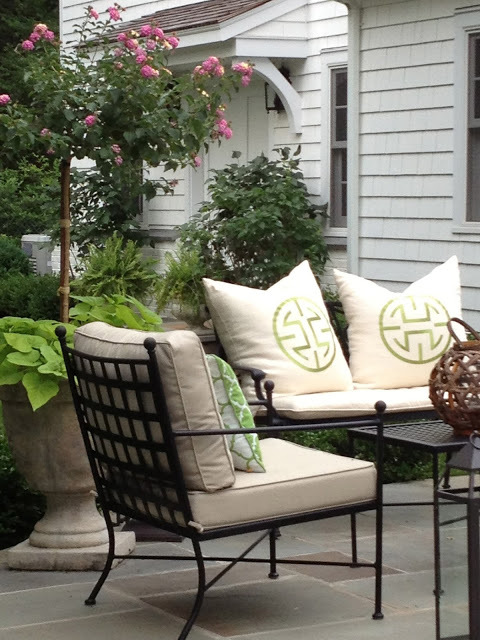 Love to sit outside and you have inspired me to look for some new fresh throw pillows! Enjoy your new space! Elizabeth, your backyard is now an oasis. Perfect choices! I love being out on the terrace on nice evening or for coffee in the morning! So lovely, Elizabeth. Watching fireflies is a favorite Summer activity. You space looks amazing. You are so talented. I also love the pillows and your plants. It's lovely! The green in the pillows is such a nice way to pick up all of the green in your yard. I have to say that I laid down for a few (too short) minutes yesterday in our hammock and it was pure bliss. I think that spot might get my vote but I don't use it as often as I'd like! Enjoy your sitting area! It's beautiful, Elizabeth and I love the pillows – the perfect touch!! It looks lovely! I'm outside on our deck most nights too. Beautiful outdoor space! I was so happy to read this post–went straight to Ballard's and purchased an outdoor coffee table that blends perfectly with what we already had. It's in our courtyard now and looks wonderful. We're just finishing a major landscape project and that always inspires a bit of "spiffing up." Love your blog–it makes me sit back, sigh and relax. Your Mother in Law is a friend from college and she led me to Pretty Pink Tulips. Thanks!